Nancy Piatczyc commented on Imaging Ioxides Scapularis and we thought her words and images were prescient and compelling. You will enjoy reading her comments and seeing more images. “Both images in the previous post are of ticks found here in Williamstown. Regarding the bottom image that looks like a flower we are guessing it shows the spiracles that the tick uses for respiration. There is one on either side of the bottom of the tick. Recently, a tick friend of mine brought in a live tick. It was from somewhere in Berkshire County, and was crawling up her arm, but not attached. So she brought it in still alive and moving, and we put it in the scanning electron microscope. We put it on a big piece of sticky tape to try to keep it from crawling off the stage, but it actually chugged across the tape pretty fast and stopped just before it fell off the edge. This was after we had put it in the scope and turned on the vacuum. Our scope operates at a very good vacuum – about 10 to the minus 6 Torr. And the tick sure enough stopped moving as the vacuum was winding up. So I took lots of images for about a half and hour with the electron beam on and the vacuum on. Then I vented it, and took out the tick on the sticky tape, and it started rapidly crawling across the tape! We were astounded. The library here has a lovely coffee table book of scanning electron microscopic (SEM) images which includes one of a jumping spider who also nicely survived the beam and the vacuum. When they say the insects will survive a nuclear war, I believe they are correct. Especially the ones with a nice hard exoskeleton. And apparently they can do without air for at least a half hour. Quite a trick. 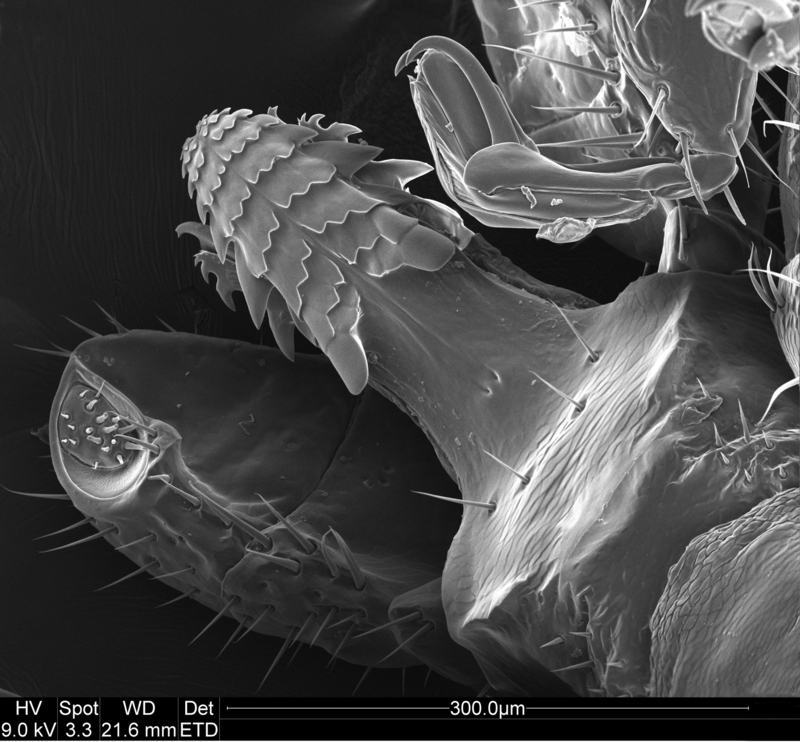 I also tried aphids from my tomato plants in the SEM, and they just blow up and turn to mush. No hard exoskeleton. This entry was posted in Elpern, David J. and tagged electron microscope, SEM, tick by humanemedicine. Bookmark the permalink.